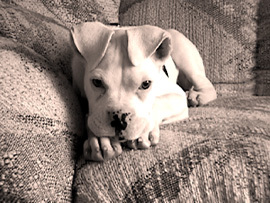 Deaf dog: Sugar is a 11 month old female white Boxer. She was born deaf. We brought her home when she was 9 weeks and she has been our baby since then. She is great with children that visit our home and has enough energy to keep up with us. Sometimes too much though. Training was hard but she is smart and has a heathly appetite, which means she'll do anything for a treat. She has already learned ten hand signs at this point (9/2002). She is very loving and we try to pay her back all the love she gives. Visit Sugar's web site by clicking here! Other comments: Deaf dogs are not any less of a dog then those with hearing. Sugar was born deaf and doesn't realize she is missing a sense. She loves life and we love her!